It is my pleasure to provide Parliamentarians and Canadians with this report on the Canadian Transportation Agency's (CTA) activities and results in 2016-2017. It was a busy and productive year for the CTA, Canada's longest-standing independent, expert tribunal and regulator. In May 2016, we launched the Regulatory Modernization Initiative (RMI), an ambitious review of all regulations the CTA administers to ensure that they are up-to-date with current business models, shippers' and travellers' expectations, and best practices in the regulatory field. The RMI's first consultation phase focused on accessible transportation and involved more than 30 face-to-face meetings and 200 written submissions. Our plan is to complete all consultations, regulatory drafting, and approvals before the end of 2018. In fall 2016, the CTA undertook targeted public information activities to help ensure that the people Parliament intended as beneficiaries of the CTA's services actually know we're here to help. These efforts contributed to a dramatic rise in the number of individuals seeking the CTA's assistance, particularly with respect to air travel and accessible transportation issues: in 2016-2017, we received an average of nearly 300 air travel complaints per month, a growth of over 300 per cent from 2015-2016, and we resolved 69 complaints from travellers with disabilities regarding accessibility issues – an increase of 50% from 2015–2016. In October 2016, the CTA returned to holding oral hearings for select cases after a hiatus of nine years. And in the first few months of 2017, we articulated the four strategic priorities that will help us focus our energies between now and 2020: a modern framework, excellence in service delivery, public and stakeholder awareness, and a healthy and high-performing organization. The fact that we got all this – and much more – done during 2016-2017 is a tribute to the professionalism and dedication of the CTA team, which is comprised of five Members and 220 public servants. Their expertise and hard work help foster an efficient, competitive, and accessible national transportation system that supports the economic and social well-being of Canadians. We are proud of what we accomplished in 2016-2017 and excited by the challenges before us. For more information on the CTA’s plans, priorities and results achieved, see the “Results: what we achieved” section of this report. Implemented a targeted public awareness campaign using print, radio, social media, web advertising as well as outreach efforts by the Chair and CEO. Subsequently, the CTA observed an increase in the average number of complaints received per month from 64 (over the previous four years) to nearly 300 which the CTA largely dealt with through productivity gains as a result of process improvements and temporary re-allocation of resources. Launched the Regulatory Modernization Initiative, with the goals of reviewing all regulations administered by the CTA and bringing them in line with contemporary business models, user expectations, and best practices in the regulatory field. Reinstated oral hearings for the first time in nine years. Oral hearings enhance the transparency of the adjudicative process while generally offering greater efficiency. Established a two-stage program for tracking and verifying insurance filings submitted under the Safe and Accountable Rail Act. The Canadian Transportation Agency is an independent, quasi-judicial tribunal and regulator. It plays a unique role with respect to the national transportation system. It helps ensure that the national transportation system runs efficiently and smoothly in the economic and social interests of all Canadians, including those who work and invest in it; the producers, shippers, travellers and businesses who rely on it; and the communities where it operates. Dispute resolution: It resolves disputes that arise between transportation providers on the one hand and their clients and neighbours on the other, using a range of tools from facilitation and mediation to arbitration and adjudication. Information provision: It provides information on the transportation system, the rights and responsibilities of transportation providers and users, as well as its services. For more general information about the CTA, see the “Supplementary information” section of this report. Further information on the organization's role, mission and mandate is available on the CTA's website. Carrying out responsibilities related to the Safe and Accountable Rail Act, including applying more stringent rail insurance requirements and handling applications by provinces and municipalities seeking reimbursement of expenses reasonably incurred in responding to fires resulting from rail operations. In addition, the CTA is dealing with a dramatic increase in the volume of air travel complaints. Newly assumed mandates and the increasing volume of air travel complaints have created pressures on the limited resources within the CTA. The CTA has improved processes, increased efficiency and productivity, and is temporarily re-allocating resources, all of which has permitted the CTA to largely manage the increase in volume of air travel complaints while delivering on both newly assumed and existing mandates. Modernization initiatives within the CTA employed enhanced project management practices and temporary resource re-allocation to ensure initiatives progressed as expected internally. Outside factors have forced modifications to timelines and project delivery expectations for some of these modernization initiatives, resulting, for example, in delays in implementing Workplace 2.0 and a new shared case management system. As the CTA's mandates continue to increase, receiving no new funding to execute both new and existing mandates introduces risks with regards to resources that are operating near limits which cannot be sustained. Maintain an up-to-date risk management framework and corporate risk profile to facilitate monitoring and reporting. Integrate planning, priority setting, and financial decision-making to strategically manage pressures. Explore cost recovery models appropriate for quasi-judicial and regulatory bodies. Make organizational adjustments to realign functions to reinforce current priorities. The CTA largely managed a dramatic increase in air travel complaints within its existing budget allocation. The CTA supports an efficient and accessible federal transportation system for users, service providers and other stakeholders through regulation of federal air, rail and marine transportation. It regulates air transportation by enforcing the Canada Transportation Act and related regulations, administering a licensing and charter permit system, authorizing code share and wet lease arrangements, supporting the negotiation of air bilateral agreements, and ensuring that terms and conditions of carriage of air carriers are consistent with Canadian legislation. It develops regulations and codes of practice to remove undue obstacles to the mobility of persons with disabilities from the federal transportation network. It regulates rail transportation by issuing certificates of fitness and enforcing compliance with minimum insurance requirements consistent with Canadian legislation and regulations. It determines railway costs, approves rail line construction, oversees the discontinuance of service, establishes the net salvage value of rail lines, and determines interswitching rates and the maximum revenue entitlement for the movement of Western grain. It regulates marine transportation by determining whether suitable Canadian vessels are available when applications are made to use foreign vessels. Developed a risk-based methodology for the Compliance Assurance Program. Engaged with stakeholder groups to increase their understanding of how the CTA determines fully allocated rail costs, as well as their rights and responsibilities under legislation and regulations administered by the CTA related to interswitching. These results support the CTA's focus on modernizing the regulatory framework and informing transportation providers and users about its services. The full scope of CTA activities supports an efficient, competitive national transportation system. The variance is primarily due to the amounts carried forward in preparation for potential pressures resulting from the renewal of collective agreements and to fund the workload associated with the increase in air travel complaints. Information on the Canadian Transportation Agency’s lower-level programs is available on the CTA’s website and in the TBS InfoBase. The CTA provides formal and informal dispute resolution services to users, service providers and others affected by the federal transportation network, including facilitation, mediation, arbitration, and adjudication. As a quasi-judicial tribunal, the CTA has the authority to issue adjudicative decisions and orders on matters within its jurisdiction over federally-regulated air, rail and marine modes of transportation and, in respect of the CTA's accessibility mandate, extra-provincial bus operations. It resolves disputes between: air travellers and air carriers regarding terms and conditions of air carriage; persons with disabilities and service providers regarding undue obstacles to the mobility of such persons within the federal transportation network; railway companies, rail shippers, provinces, municipalities and neighbors regarding a wide range of matters including railway level of service, infrastructure, crossings, interswitching, and noise and vibration. Implemented a targeted public awareness campaign using print, radio, social media, web advertising as well as outreach efforts by the Chair and CEO. Outreach by the CTA’s Chair and CEO included eight keynote addresses and 18 media interviews. Observed a record volume of air travel complaints where an average of 64 complaints per month (over the previous four years) increased to nearly 300. Increased productivity through improved processes and a temporary re-allocation of resources have permitted the CTA to largely manage this increase in volume. Held its first oral hearing in nine years. Oral hearings enhance the transparency of the adjudicative process while generally offering greater efficiency compared to written pleadings alone, especially in complex cases. Improved service to Canadians in the facilitation process by simplifying forms, processes and messaging, and increasing direct phone contact with Canadians wherever possible. Created a permanent Registrar position to provide a resource dedicated to assisting Canadians to understand the CTA’s Dispute Adjudication Rules and to interact more efficiently and effectively with the CTA. In parallel with the increased awareness by the Canadian public of the CTA’s services, air travel complaint volumes have continued to rapidly increase and the CTA must continue to improve productivity and timelines in order to keep up with this increasing demand for services. Improved people management through the CTA's On the Move Action Plan, including implementing staff performance feedback tools, recognition programs, mental health initiatives and the assignment of a Champion for collaboration and innovation. Improved internal transparency and dialogue through regular all-staff Town Hall meetings which ensure understanding of strategic direction and support onboarding of new employees. Strengthened financial management practices through enhanced monitoring, with a particular focus on monitoring financial targets linked to management responsibilities. These activities served to motivate and align front-line staff to focus their efforts on delivering results for industry, travellers (including persons with disabilities), shippers and other users of the national transportation system. For fiscal years 2014-2015, 2015-2016 and 2016-2017, the amounts shown represent the actual expenditures as reported in the Public Accounts. For fiscal year 2017-2018, the planned spending reflects increased funding of $3.5 million approved through the Main Estimates to pay for the costs related to the Government of Canada Workplace 2.0 Fit-up Standards. This amount is reflected under Internal Services Program and will be reimbursed over a period of 15 years. For the period 2018-2019 to 2019-2020, the planned spending reflects approved funding by Treasury Board to support the CTA's Strategic Outcome and Programs. These expenditures vary slightly in previous years as they do not include the reimbursement of eligible paylist expenditures and budget carry forwards as these cannot be estimated with certainty. The 2016–2017 variances between Main Estimates, Planned Spending, Total Authorities and Actual Spending are largely attributable to the timing of key elements of the fiscal cycle. The 2016-2017 Total Authorities ($28.3 million) represent Main Estimates ($27.8 million), plus adjustments to authorities approved by the Treasury Board, such as Operational Budget Carry-Forward. Total CTA spending for 2016-2017 ($26.9 million) was lower than 2015-2016 ($28.2 million) and previous years. This variance is primarily due to the amounts carried forward in preparation for potential pressures resulting from the renewal of collective agreements and to fund the workload associated with the increase in air travel complaints. 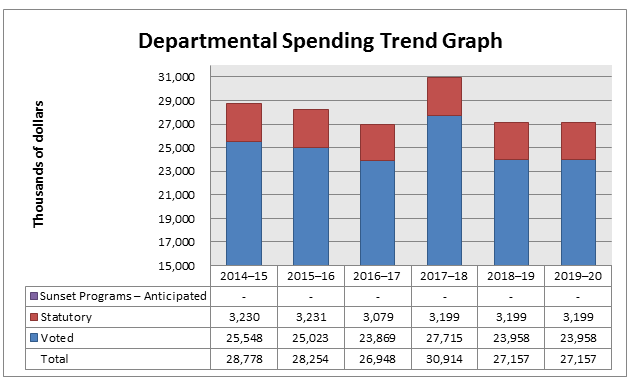 Program spending from 2016-2017 is different from previous years due to the updates to the Treasury Board Secretariat's Guide on Recording and Reporting of Internal Services Expenditures. Finally, the 2017-2018 Planned Spending demonstrates an increase as it includes the expected cost of the implementation of the Government of Canada's Workplace 2.0 Fit-up Standards. Following the implementation of a new organizational structure at the beginning of 2016-2017, the CTA streamlined the proportion of its human resources expenditures allocated to back-office operations, enabling it to re-allocate resources to address some pressures such as the increase of workload in air travel complaints. Human resources planning figures are drawn from the CTA's Main Estimates for 2017-2018 and 2018-2019. Given the timing of the Main Estimates submission process, the above planned human resources were not able to take into account a sustained and growing surge in disputes submitted to the CTA, which is forecasted to require that a proportionally greater percentage of total CTA human resources be allocated to Adjudication and Alternative Dispute Resolution over the next few years. For information on the CTA’s organizational voted and statutory expenditures, consult the Public Accounts of Canada 2017. The CTA’s financial statements [unaudited] for the year ended March 31, 2017 are available on the CTA’s website. These Acts and Regulations are available on the Department of Justice website, and are accessible through the Acts and Regulations section of the CTA website. The CTA's Strategic Outcome and Program Alignment Architecture of record for 2016–2017 are shown below. Supporting information on results, financial and human resources related to the CTA Program Inventory is available in the TBS InfoBase. For the purpose of the 2016–2017 Departmental Results Report, government-wide priorities refer to those high-level themes outlining the government’s agenda in the 2015 Speech from the Throne, namely: Growth for the Middle Class; Open and Transparent Government; A Clean Environment and a Strong Economy; Diversity is Canada's Strength; and Security and Opportunity. The articulation of strategic choices, which provide information on how an organization intends to achieve its priorities and associated results. Generally a plan will explain the logic behind the strategies chosen and tend to focus on actions that lead up to the expected result. Targeted regulations and voluntary codes of practice are those which have been identified for compliance monitoring through the application of a risk-based approach. Reporting deferred until 2016/2017 based on a review of business processes, case management system enhancements, and the performance and reporting methodology.